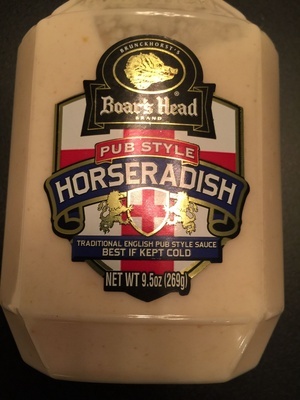 Brands: boar's Head, Boar's Head Provision Co. Inc.
Canola oil, water, horseradish, vinegar, sugar, egg yolks, xanthan gum, lemon juice, salt, ground mustard seeds, tocopherol (a natural preservative). Product added on January 27, 2015 at 3:51:28 AM CET by openfoodfacts-contributors. Last edit of product page on March 9, 2017 at 5:42:01 PM CET by usda-ndb-import. Product page also edited by upcbot.